Different kinds of dining establishments require different kinds of menu designs. For instance, a fine dining restaurant will require a formal menu booklet while a barbecue pub will need a BBQ menu card. Using a menu card design that does not fit your establishment’s niche may turn off customers. 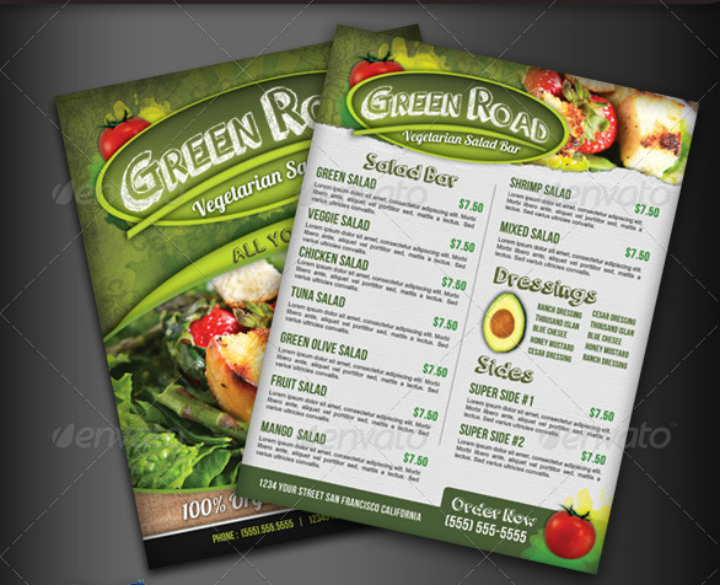 Likewise, if you own a salad bar restaurant, a salad bar menu design should be used when crafting your own menu card. 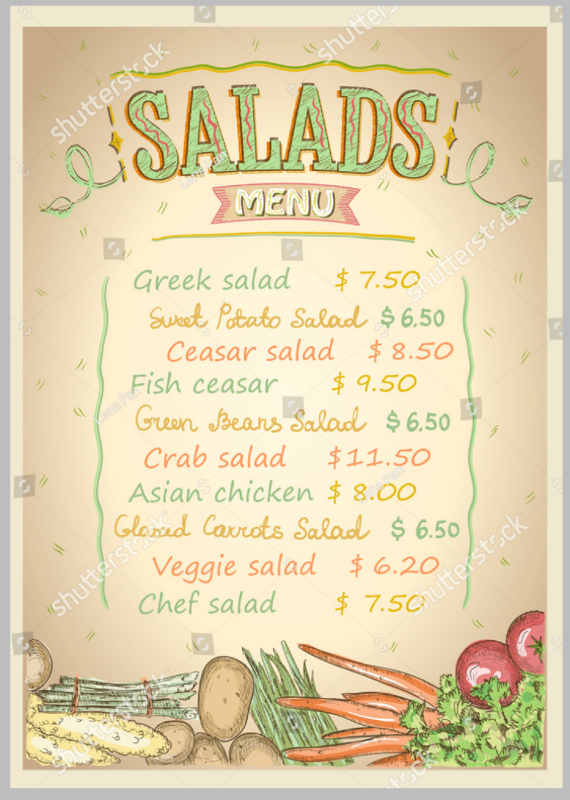 In this article, we share 15 examples of salad bar menu templates that any person (whether you are a restaurateur or just a regular person planning a salad party) may use and/or recreate for your own menu design. Guidelines for creating standout salad menu designs are also briefly discussed in the next few paragraphs. The Supasalad Menu Template embedded above is an example of a text-laden salad bar menu design. There are no images of the different healthy salads included in the menu. However, the ingredient list, uncluttered menu layout, and visible pricing information make up for this. 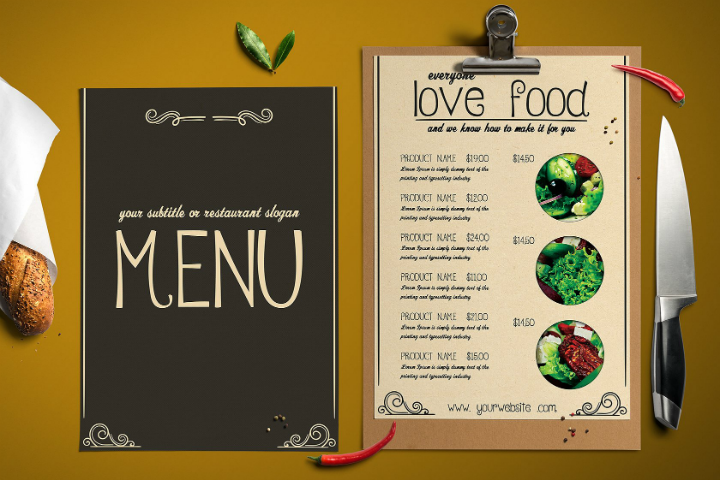 This kind of menu card design may suit those who want a minimalist menu card design. 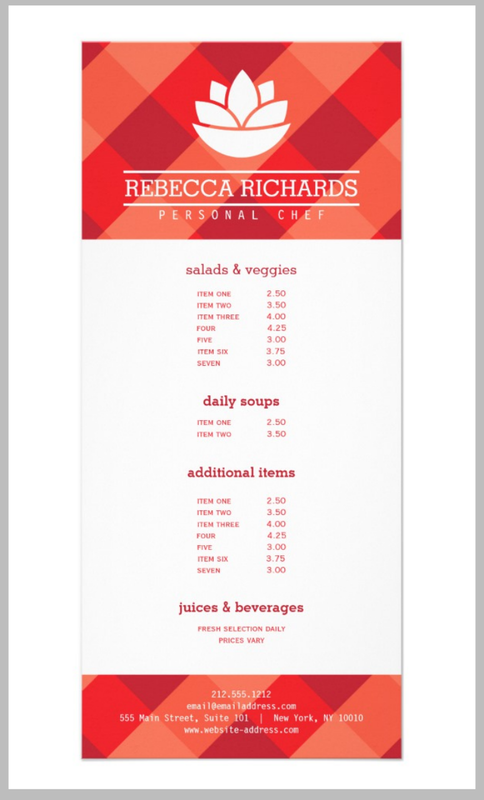 The Juice and Salad Bar Menu Template pictured above is an example of a trifold menu card design. This menu template works well if you want comprehensive descriptions of each salad dish on the menu card. This card design psd also follows an organized layout scheme so your customers will not have a difficult time in reading it. Know what design you want. When creating any type of menu card design, the main criteria would be your own set of preferences. Of course, this may be largely influenced by different factors like your environment, your brand’s own image, and even your target market. Finding common ground between these factors equates to finding the best menu design for your business. When you and your brand are clear on the design concept you want, the rest of the steps in menu card creation will be easier. Determine the focus of your salad bar menu design. Once you have decided on a card design concept that will serve as your inspiration, you should next decide if you want an image-centric or a text-laden menu design. 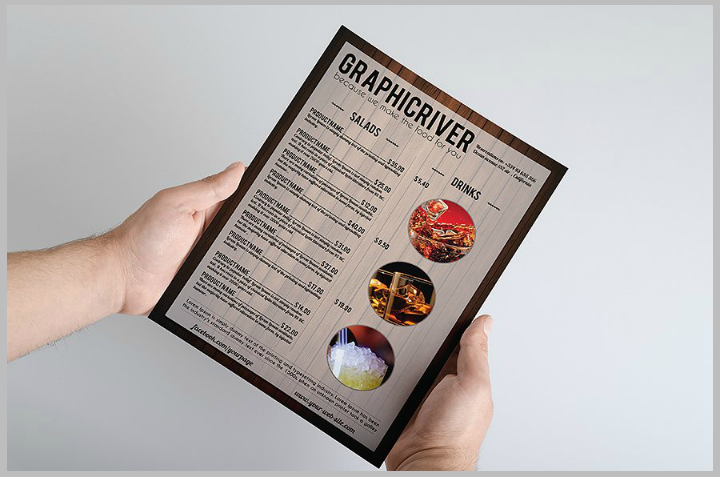 There are different pros and cons for each type of menu card presentation. However, if you want the best of both worlds, you may easily combine both images and text in your menu design. Place food descriptions and their corresponding prices. Brief descriptions of the main ingredients and the preparation methods used to create the salads that your restaurant offers should be included in your menu list template. This is especially important for customers who are health-conscious or those who have specific food allergies. Adding the cost of a specific meal on the menu card is not considered taboo. In fact, this is required so that customers will have a rough idea of how much they are spending. For information on how to format food menu descriptions, check out this article on menu description writing tips. Use a good layout design. 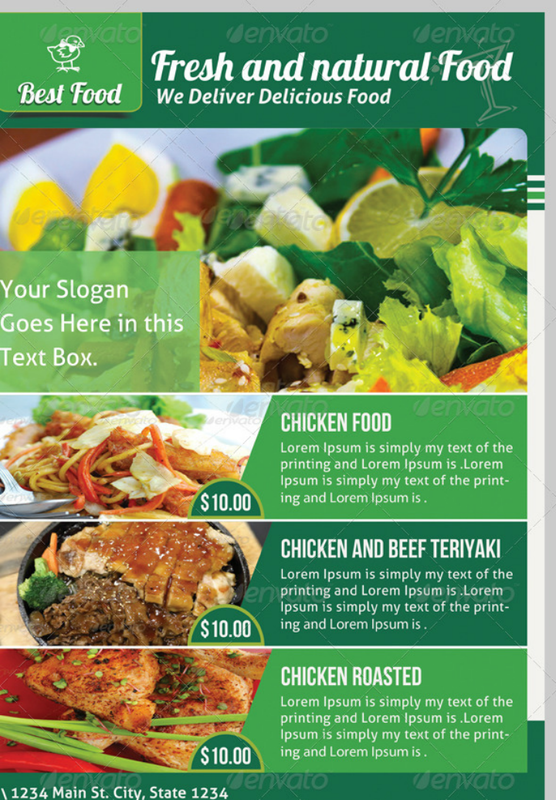 Another important factor to consider when creating menu cards is the layout template that you follow. A layout acts as the framework of how the different design and text elements are arranged in the menu. Choosing a good layout design helps create a clean and uncluttered menu layout. Follow food photography techniques. How many times have you felt pulled into buying something online because you think the dress or pair of shoes looks good? Online marketers make sure to use universally flattering poses and pictures to achieve positive results (i.e. more sales). This same strategy may also be applied to your own salad bar menu design by using high-quality photos of the different salad dishes that you offer. If you do not feel confident in your own photography skills, you may learn food photography through free online tutorials or even learn Photoshop tutorials. Or you may also hire a professional photographer to do the job. Test or request for feedback on any menu design before finalizing it. This step especially applies to restaurants that have multiple owners and/or those who are operating franchise businesses. Sometimes, the specific design direction that a menu card takes will require the approval of a lot of people. Graphic designers who are tasked to create a salad bar menu for companies like these should make sure to consult the management team at every step of the design process. Proofread the material before printing. Once all the management consultation and approval is done, it is time to proofread and fact check the menu card template. Check for any grammar and spelling errors. Also, make sure that the prices indicated on the menu card are accurate and updated. Make sure that the correct image contains the correct captions and vice versa. If your menu card design includes company history information, it is best to fact check these pieces of information before printing the entire menu card. Use good quality card stock for printing. 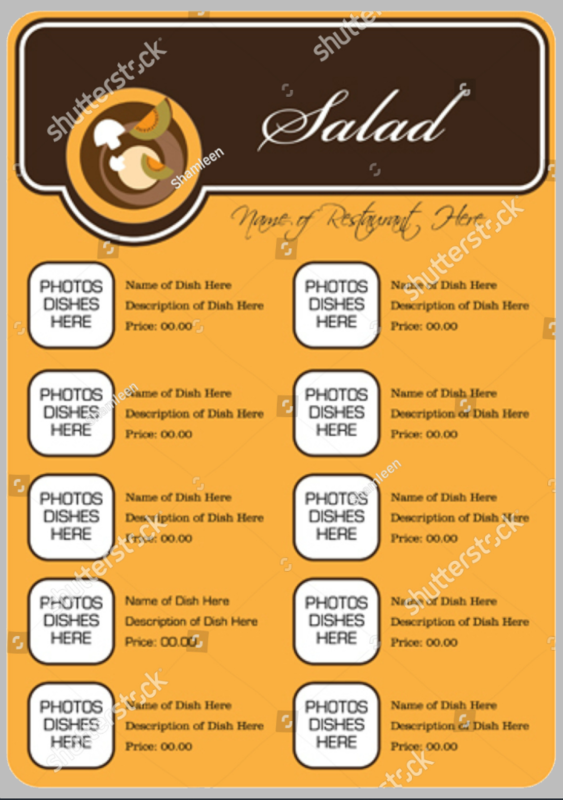 After making the necessary corrections on the menu card template, you may now print out the salad bar menu design. As with any type of card design, it is best to use high-quality cardstock or thick premium paper. 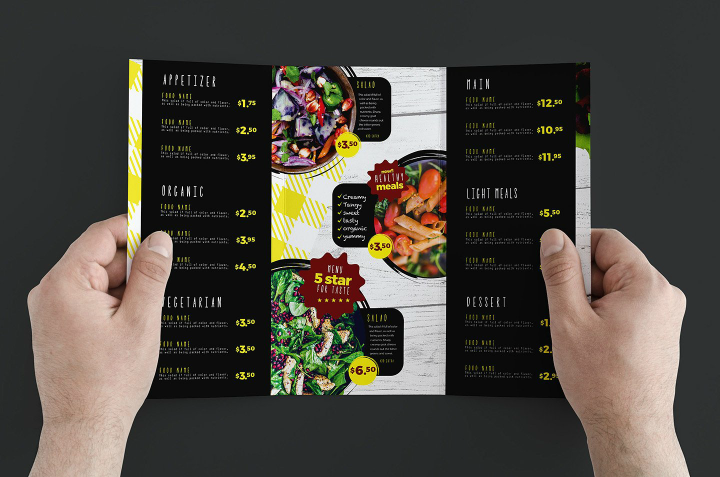 But if you intend to give away copies of your menu to prospective customers, it may be more cost-efficient to use photocopies or use thinner paper instead. The Realistic Salad Bar Menu Flyer Template shown above is the menu template to follow if you want to showcase different high-quality photos of your different salad dishes. There is also ample space for writing brief descriptions on this template. 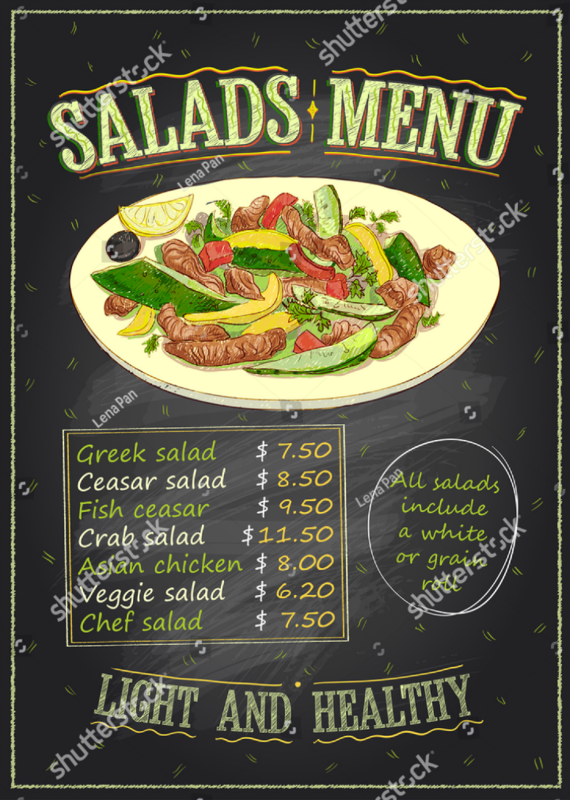 If you want a menu card design that allows you to use pictures and write descriptions, this salad bar menu design may be the one you are looking for. Choose the Assorted Salads Menu Template embedded above if your restaurant follows a creative approach to salad creation. A chalkboard design is especially helpful in furthering that effect since it is an uncommon menu design to be used for a salad bar menu design. 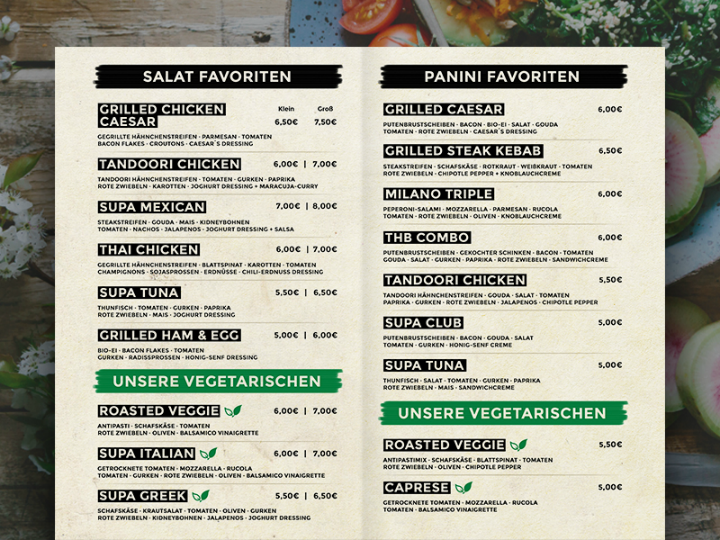 When creating a salad bar menu design, you need to keep in mind that there are different formats that a salad bar menu can follow. We have listed the most common types below. Use them accordingly depending on the specific needs that your dining establishment needs. Overhead menu. This is the type of menu design that is typically seen at the counter of a fast food chain, pub or dinner where you have to line up, order, and make a payment. Overhead menu card designs are often large often to be seen from a short distance. They also sport both large pictures and typefaces to make sure that customers can easily see and read them. Table tent menu. Some dining establishments make use of tent menu cards and place them on the restaurant tables. This way, any customer who comes in will easily see the menu card and only call on a waiter or waitress when they are ready to order. Table tent menu card designs are often small in size just like a rack card. In addition, tent menu cards will have their own foldable parts that act as the base for the entire menu card. Booklet menu. The most common type of menu card is the booklet menu. This menu card format is typically used in formal dining restaurants and during formal events. 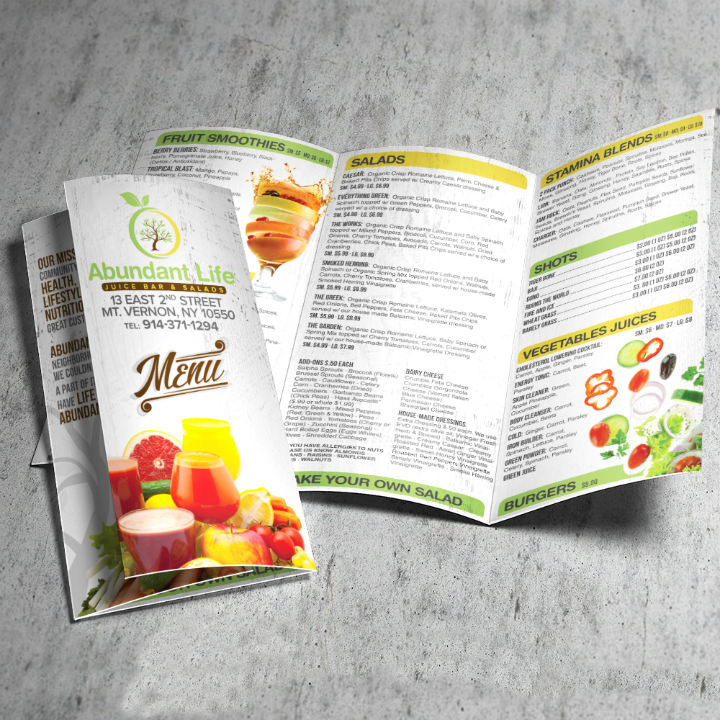 Booklet menu designs take more time and money to create since each page is meticulously designed before being printed. They are vastly different from take out menus that are commonly printed on one piece of paper or cardstock. Flyer menu. Flyer menu cards may serve both as a restaurant marketing tool and as a food list. Menu flyer templates allow restaurateurs to advertise their businesses by including a list of their food offerings on the flyer design. Flyer menus are often given away by restaurant employees to anyone who happens to pass by their establishment. 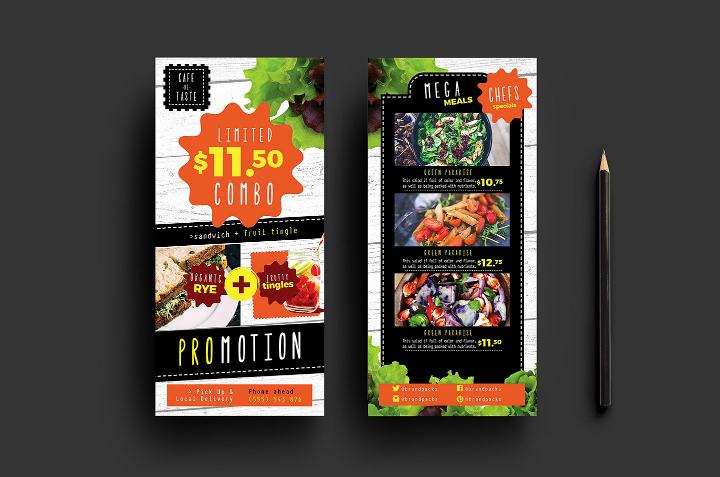 As an advertising tool, flyer menus will also include discount offers that will help attract more customers. Standee menu. Another type of menu design format is a standee menu. This menu design format is typically placed outside a dining establishment where passersby can see and read the menu. Often, a standee menu design will include a life-sized cutout of a celebrity who is endorsing the restaurant franchise. 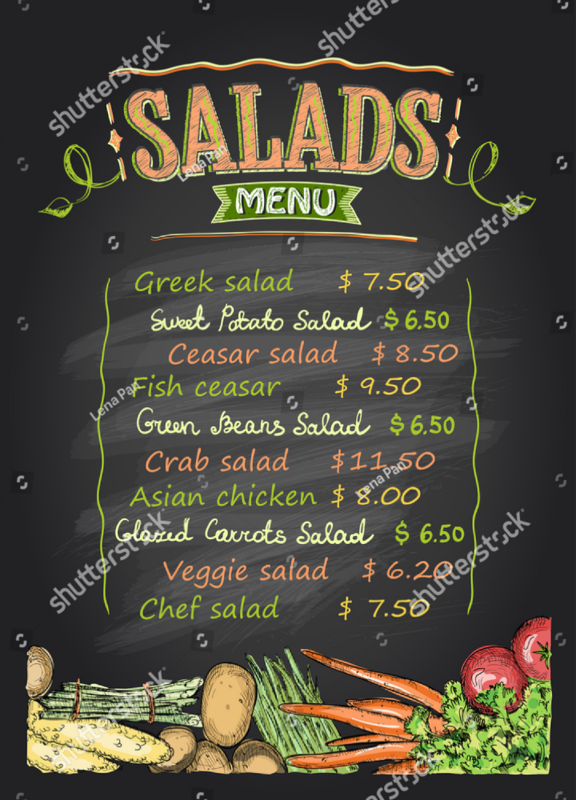 The Chalkboard Salad Bar List Menu Template is another menu template based on chalkboard designs. What sets this menu template apart is the image of a salad on top of the menu board. When creating your own menu card design, it may be best to use a picture of your own salad dishes. Salads are usually part of a vegan or vegetarian diet. 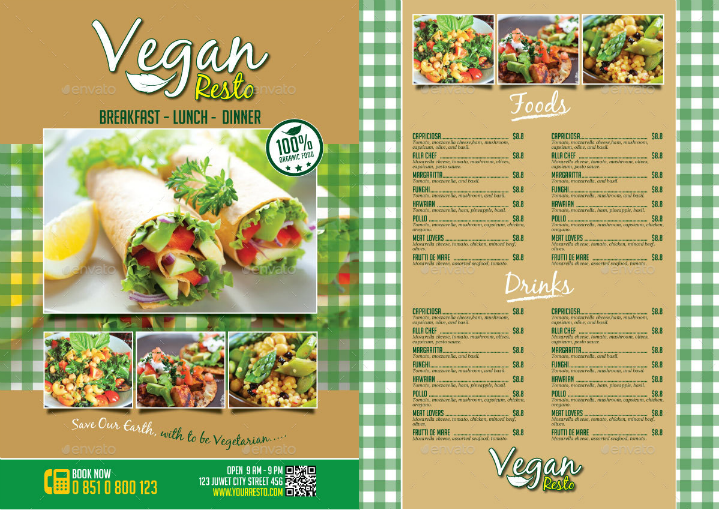 The Vegan Salad Bar Menu Template will suit dining establishments that cater to those who choose to follow an environmentally-sustainable and healthy lifestyle. In this customizable menu template, you can create a salad menu page and separate menu pages for different vegan meal courses. For more information on menu creation, check out this tutorial for steps to create menu cards.